While most coffee lovers are familiar with Colombian coffee and Ethiopian coffee, very few have heard of Honduran coffee. Possessing a variety of tasting notes — which can range from apricot and tropical fruit to chocolate and caramel — Honduran coffee is developing quite a following in its own right. Bordered by the Caribbean Sea on its northern coast and the Pacific Ocean in the South, Honduras is a Central American country with a population of approximately 9.1 million. Its total area is roughly 43,400 square miles and consists of mostly mountains, plains along the coast, an undeveloped jungle in the northeast, and the densely populated Sula Valley in the northwest. Generally, its climate is more temperate in the mountains and more tropical in the lowlands. While the exact origins of Honduran coffee are not known, many people believe the coffee bean was first introduced to Honduras by Spanish traders in the latter part of the 1700s. Available census information collected at the beginning of the 1800s indicates that coffee was then grown on a small scale by farmers throughout the entire century. However, despite the efforts of some Honduran presidents to promote the coffee bean, the banana quickly became one of Honduras’ major cash crops due to the much shorter time between its first planting and harvest. Then, in the latter half of the 1900s, the cultivation of coffee by small scale farmers increased. Unfortunately, it encountered quite a few setbacks. In 1998, for instance, Hurricane Mitch wiped out 80% of Honduras’ crops, and smugglers, who could could get better prices for the beans in neighboring Guatemala, also negatively impacted Honduras’ coffee industry. All that changed in the late 1990s. The Honduran government implemented a tax on coffee exports and used the resulting money to improve roads to coffee-growing regions. Additionally, the government provided fiscal incentives to coffee growers, which resulted in an increase in both the quality and quantity of the coffee produced. Initially, Honduran coffee was used only as a base for coffee blends. Though its Central and South American neighbors were all exporting higher quality coffee, buyers viewed Honduran coffee as a low-priced commodity due to its lack of quality control. Promotes Honduran coffee both within Honduras and abroad. Provides technical training for farmers. Assists with the founding of nurseries and greenhouses. Provides low-interest loans for equipment. Trains young Hondurans in coffee quality control through their national cupping school. Due to its temperate and tropical climates, Honduras produces coffees which are typically described as mild, robust, and sweet. Grown at altitudes of between 3,600 and 5,249 feet above sea level, Honduran coffee beans can be classified by both the altitude and region in which they were grown. Every year, beans are harvested between the months of November and April, and it is estimated that two million Hondurans work to harvest beans from the 90 million plus coffee trees cultivated throughout the country. For best results, the coffee cherries are picked at their red berry stage during multiple pickings to give the beans time to ripen. Also, depending on the region’s unique climate and elevation, each region’s coffee will have its own signature flavor profile. Honduran coffee is aromatic and fragrant with notes of vanilla or hazelnut. Its body is often described as medium and round, and its acidity is generally well-balanced. Because Honduras contains both lowlands and more mountainous terrain, the coffee it produces is graded according to its elevation. For those who want to drink the highest quality coffee Honduras has to offer, bird-friendly or shade-grown coffee — which is a step above strictly high grown — is also available. These bushes are grown in the shade of other trees, which gives the Honduran coffee beans more time to mature, absorb nutrients and minerals, and develop a more robust flavor. Due to its broad range of climate conditions and overall rich soil, Honduras’ six coffee regions produce highly-prized coffee which ranges in flavor from tropical fruit to chocolate. For this reason, it is often difficult to pick out a Honduran coffee in a blend. Though each region is unique, let’s take a look at the three regions with the most distinctive flavors. Copan is the dark green marker all the way to the left (west) on the map above. Bourbon, Caturra, and Catuai are cultivated in this region, and it is marked by the Honduran Western Coffees Geographical Indication as a notable region. Agalta is the red marker all the way to the right (east) on the map above. Located in the southeastern part of Honduras, the tropical climate of Agalta yields fruity-tasting coffee. With an elevation of between 3,609 and 4,593 feet above sea level, its coffee’s aroma is rather caramel and chocolaty. It showcases a wide variety of tropical, fruity notes and has a pronounced acidity with a sweet finish. The most common arabica varieties grown here are Bourbon, Caturra, and Typica. Montecillos is the light green marker third from the left (west) on the map above. Last, but certainly not least, is Montecillos. It holds the distinction of being Honduras’ first origin denomination, aka. Café de Marcala. Located on the border near El Salvador, coffee grows at an altitude of between 3,937 and 5,249 feet above sea level. As a result, the colder nights bring out the coffee’s sweeter peach, apricot, caramel, and citrus notes. To round out the unique flavor profile, it has a velvety body with a bright acidity. Cultivated at an altitude of between 4,250 and 5,575 feet, the Marcala Fair Trade Coffee from Fresh Roasted Coffee is a medium roast with a bold body. Its cupping notes include walnut, milk chocolate, and lemon. It is harvested between December and April, wet processed, roasted, and exported from February to June. Grown in Honduras’ Marcala region, Trader Joe’s organic, fair trade coffee is a medium-dark roast which is light and mellow. A customer on Amazon notes that it has a smooth, earthy, aromatic flavor with no acidity. Finally, for those coffee connoisseurs who are comfortable with roasting their own beans, Honduran green coffee beans are available for purchase online. These beans are fair trade, organic, washed, sun-dried, and come packaged ready to roast. With its broad range of flavors and ideal climate, Honduran coffee has flavors and aromas to please every palate. Pick from a selection of premium, fair trade, shade-grown beans or green beans for home-roasting. 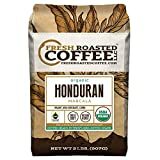 I recently visited Roatan, Honduras and purchased a pound of Wellu Honduran Artisan Coffee. Te label indicates a website, Facebook, Instagram and other social medias sites. I am not able to find this brand any where on the web. Do you know of it or have any insight here? I was searching for the same information after a recent visit to Roatan too. I purchased the coffee and was trying to find a way to order more. I have found zero websites or social media links that work for Wellu coffee either. The coffee is delicious! This is the information I gathered from TV programs and speaking to small farmers in Honduras in February 2019 . The price is falling so low the government is going to need to subsidize farmers to keep production Going.